It’s no secret that i’m a bit of a Topshop-aholic, not even sorry. 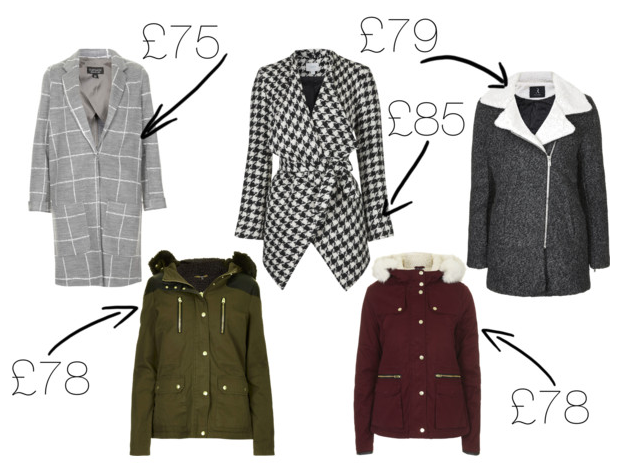 Last year I bought, hands down, the best coat in the world from Topshop and this year, i’m eyeing them up again and I need your help to help me decide which I should get! So here are the options. Next up is a Parka Jacket, of course! Such a casual/essential for winter! The parka I bagged last year is rather large/hefty, no hate, but sometimes you just want something a bit lighter, especially if you’re going to have to be taking it on and off constantly. What makes this jacket for me is the furry hood, winning? Buy it here for £78. This jacket is pretty much the same as the first parka except it’s a deep wine red shade rather than your usual parka colour. Perfect for the festive season, don’t you think? Again, available for £78. Last but not least is this Wool and Fleece Style Wrap Over Coat. Another that I feel i’d certainly have to try on in store. The majority of my wardrobe is black and white, so i’m slowly adding some grey to it, daring I know! Another classy fit that can be thrown over something casual to jazz it up but look equally as beautiful over a smart evening outfit. So which do you think I should snap up!? Which is your favourite? Let me know below!